Notifier plugin for Mail replaces sound warning with animation. Is there a better alternative to MailFX? Is MailFX really the best app in Email category? Will MailFX work good on macOS 10.13.4? 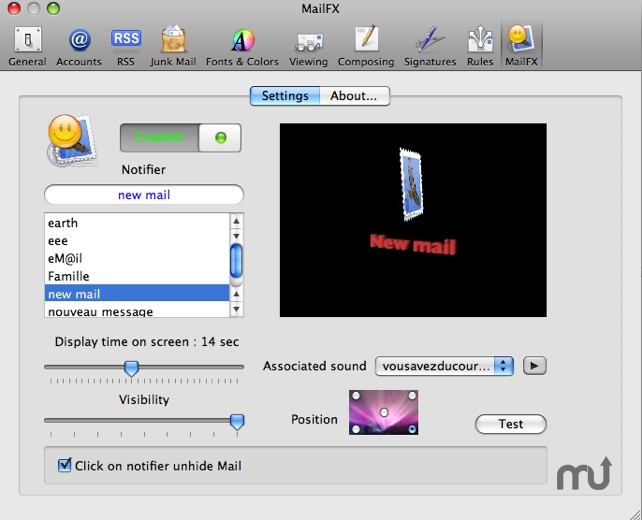 MailFX is a plugin for Mail, MailFX is a notifier which replaces (or complete) the sound warning of Mail OS X by a graphic animation (Quartz composition). Correction of bug (a crash could occur while clicking on the notifier). MailFX needs a rating. Be the first to rate this app and get the discussion started!